Ullr Ski Medals, Unique, Collectable, Custom Made Ski Medals. Ski Medals to Commemorate Ski Events - Ski Resort Events and Ski Resort Openings! ULLR SKI MEDALS is an ad specialty company dedicated to providing the ski industry with the highest quality collectable gifts and event premiums. These items offer the ski industry a unique way to advertise its resort or events. 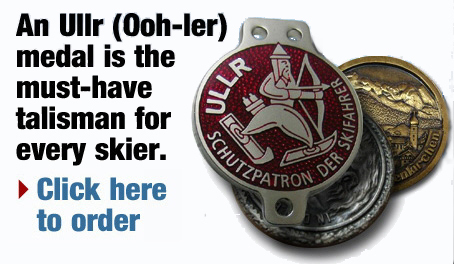 The main product offering is the ULLR SKI MEDAL. These medals are an ideal alternative to t-shirts and hats for event SWAG and gift shop merchandise. Hats get lost, t-shirts get dirty, an ULLR SKI MEDAL will hang off a daypack or ski bag forever. Ullr is the mythical Norse God of Winter who enjoyed the cold weather and loved traveling throughout the land, gliding along on his skis or snowshoes. He was, in fact, unbeatable on skis, never losing a race. Some believe the Aurora Borealis is the snow flying off the tail of his skis. In Germanic mythology Ullr is the main ski god of the 19th and 20th century; his character helped to establish a feeling of common identity among skiing pioneers in Norway and Central Europe, who prayed to him to insure the earth will be covered with snow, protecting it from winter's harm. In the United States, ski towns throw parties and parades in his honor. Ullr medals have been popular with European skiers for over 100 years; they wear them for protection from harm while on the mountain. These medals have become highly collectible. 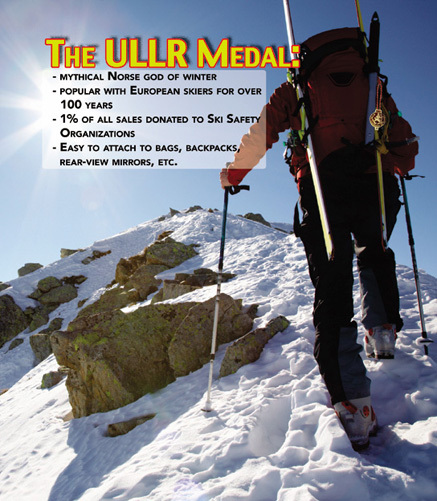 ULLR SKI MEDALS is bringing these coveted medals to the United States and is offering you the unique opportunity of providing them to your guests at your events and through your gift shop. These die-struck bronze medallions can be plated with many different finishes and are offered in many different sizes and styles. Genuine hard enamel can be added to enhance the design. Ullr appears on the front, and your logo and message appear on the back. ULLR SKI MEDALS are a great way to commemorate any skiing related event. Your guests will snap them up in your gift shop, as they attach easily to ski bags, backpacks, a rear-view mirror, etc. They also make beautiful Christmas ornaments and gifts. As these medals increase in popularity in the United States, you'll want to be among the first to offer them! P.S. ULLR SKI MEDALS is committed to making skiing safer by donating one percent of all sales to ski safety organizations such as the National Ski patrol, American Avalanche Association, etc. Don't miss out – place your order today!